UPDATE: Surgery complete and successful. Doctor said my running days are over. Rats! Now bikes, elliptical, swimming and brisk walking. I love to run and I must have twisted or jerked my knee the wrong way last September when I could feel the pain and swelling. An MRI revealed a torn meniscus which is the cushion between the leg and thigh bones. I am going in for surgery to repair it Wednesday at 8:00 AM Eastern with prep work beginning at 7:00. Geez, I am not looking forward to this — though I am anxious to have it fixed so I can hit the road again. I have NEVER been in a hospital before and this is the first surgery of any kind for me. Please pray that God will guide the good Catholic surgeon’s hand. 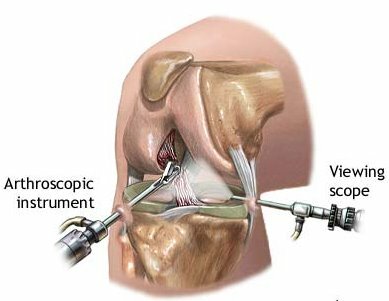 Arthroscopy is the examination of a joint with a device called an arthroscope inserted through a small incision in the skin. An arthroscope is a small, illuminated camera at the end of a narrow tube. It is connected to a monitor to allow for examination, diagnosis and repair of joint problems. Sometimes arthroscopy is used only to do a visual inspection and make a diagnosis. With arthroscopic surgery, instruments such as scissors or lasers are inserted through additional small incisions that are much less invasive than traditional open surgeries. Arthroscopy is performed with the patient under anaesthesia. The surgeon makes an incision in the skin near the joint and inserts an arthroscope. Surgical instruments can be inserted to repair or remove damaged tissues. However, arthroscopy cannot resolve some joint problems, which may need traditional open surgery. It is usually an outpatient surgery, with the patient going home after spending a few hours in a recovery room. Medications may be prescribed for pain, inflammation and prevention of infection. The patient can usually resume normal activities in a few days. Sports players can go back to their sports activities within 5-6 days. And an working Lady or a man can switch on their work within 3-4 days. This is what the doctor is doing to me at 8:00 Wednesday!